Immune checkpoint inhibitors (CPIs) are a relatively new class of ‘miracle’ dugs that have revolutionised the treatment and prognosis of some advanced-stage malignancies, and have increased the survival rates significantly. This class of drugs includes cytotoxic T lymphocyte antigen-4 inhibitors such as ipilimumab; programmed cell death protein-1 inhibitors such as nivolumab, pembrolizumab and avelumab; and programmed cell death protein ligand-1 inhibitors such as atezolizumab. These drugs stimulate the immune system by blocking the coinhibitory receptors on the T cells and lead to antitumoural response. However, a flip side of these novel drugs is immune-related adverse events (irAEs), secondary to immune-mediated process due to disrupted self-tolerance. The irAEs in the gastrointestinal (GI) tract/liver may result in diarrhoea, colitis or hepatitis. An accurate diagnosis of CPI-induced colitis and/or hepatitis is essential for optimal patient management. As we anticipate greater use of these drugs in the future given the significant clinical response, pathologists need to be aware of the spectrum of histological findings that may be encountered in GI and/or liver biopsies received from these patients, as well as differentiate them from its histopathological mimics. This present review discusses the clinical features, detailed histopathological features, management and the differential diagnosis of the luminal GI and hepatic irAEs that may be encountered secondary to CPI therapy. Given the successful therapeutic responses and survival benefits seen in many patients treated with CPI therapy, it is anticipated that the use of these drugs will increase more so in the future, and will probably lead to an increased number of patients seen in clinical practice affected by CPI therapy-induced irAEs. An accurate diagnosis is crucial for optimal patient management and preventing further worsening of irAEs in these patients. The current review gives an overview of the clinical findings, detailed histopathological features, differential diagnosis and management of CPI therapy-induced irAEs encountered in the luminal GI tract and the liver. Immune checkpoints including CTLA-4, PD-1 and PD-L1 receptors downregulate T cell immunity. Blockage of these checkpoints promotes activation and proliferation of the effector T cells, thereby enhancing the cellular immunity. Grade 1: increase of <4 stools per day over baseline. Grade 2: increase of 4–6 stools per day over baseline. Grade 3: increase of 7 or more stools per day over baseline, incontinence, hospitalisation indicated, limiting self-care activities of daily living. Grade 4: life-threatening consequences, urgent intervention indicated. Grade 1: asymptomatic, clinical or diagnostic observations only, intervention not indicated. Grade 2: abdominal pain, mucus or blood in stool. Grade 3: severe abdominal pain, change in bowel habits, medical intervention indicated, peritoneal signs. Dense, predominantly lymphocytic infiltrate in the lamina propria along with frequent plasma cells and eosinophils (figure 1). Neutrophilic inflammation is commonly seen, including neutrophilic cryptitis and crypt microabscesses, as well as increased crypt epithelial apoptosis (figures 1 and 2). Variable increase in intraepithelial lymphocytes (IELs) (figure 3). Notably, in most studies, features of chronicity (such as well-formed basilar lymphoplasmacytosis, significant architectural distortion and Paneth cell metaplasia in the left colon) are typically absent. Low-power photomicrograph highlighting dense, predominantly lymphoplasmacytic lamina propria inflammatory cell infiltrate along with frequent eosinophils seen with anti-CTLA-4-induced colitis (H&E ×100). A similar pattern of injury has been reported with anti-PD-1 colitis. The bottom left inset (H&E ×200) highlights neutrophilic cryptitis and crypt abscess, and the top right inset shows neutrophilic crypt abscess and crypt atrophy, typically seen in these cases (H&E ×400). CTLA-4, cytotoxic T lymphocyte antigen-4; PD-1, programmed cell death protein-1. Lower power photomicrograph highlighting active colitis with increased apoptosis seen with anti-PD-1 therapy in this case. 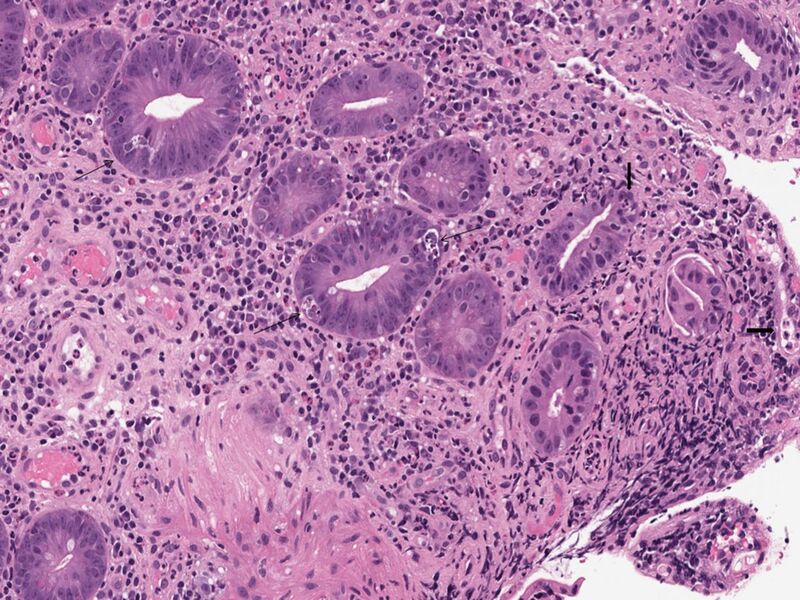 The biopsy shows active mucosal injury including neutrophilic crypt microabscesses and cryptitis (highlighted by thick arrows), and increased crypt epithelial cell apoptosis (highlighted by thin arrows) with the presence of crypt atrophy and dropout. Similar features have been described with anti-CTLA-4-induced colitis (H&E ×200). CTLA-4, cytotoxic T lymphocyte antigen-4; PD-1, programmed cell death protein-1. ‘Lymphocytic colitis pattern of injury’ seen with anti-PD-1 therapy effect. Similar findings can be seen in patients with anti-CTLA-4 colitis. The biopsies exhibit increase in intraepithelial lymphocytes along with evidence of surface epithelial injury, and increased lamina propria mononuclear inflammatory cells. Neutrophilic injury is absent in this case (H&E ×100; inset H&E ×400). CTLA-4, cytotoxic T lymphocyte antigen-4; PD-1, programmed cell death protein-1. The histopathological features of anti-PD-1-associated colitis reported in the literature are fairly similar and usually fit into one of the patterns of injury described below. A patient with recurrent anti-PD-1 colitis showing features of chronic mucosal injury, in the form of basilar lymphoplasmacytosis and significant crypt architectural distortion. 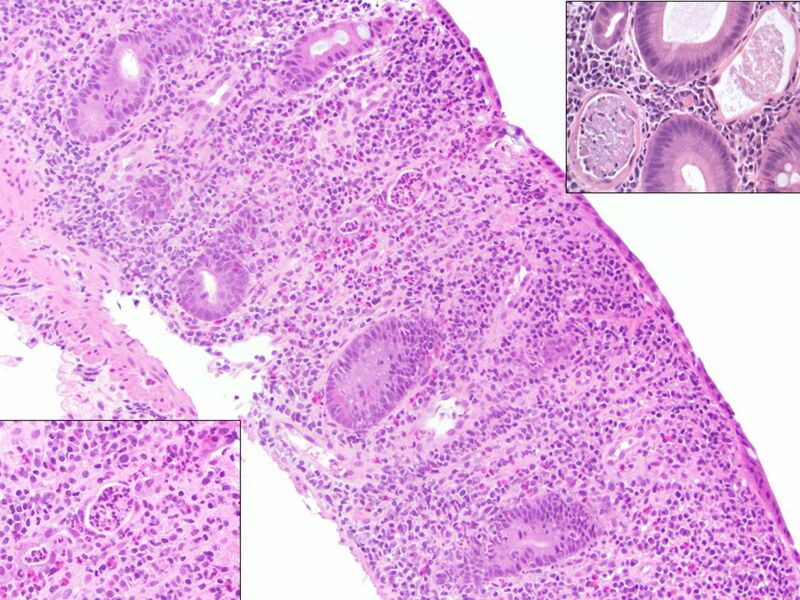 The lamina propria shows mixed inflammatory infiltrate including prominent eosinophils (H&E ×100). PD-1, programmed cell death protein-1. Since patients with CPI-induced GI injury mostly undergo colonic biopsies, there is very limited body of literature reviewing histopathological findings in biopsies taken from other luminal GI sites outside of the colon. Lymphocytic colitis pattern of injury can be seen secondary to multiple other medications reported in the literature, such as non-steroidal anti-inflammatory drugs, proton pump inhibitors and histamine receptor inhibitors, among others.37 Again a definitive diagnosis requires clinical history of CPI therapy, along with being aware that CPI therapy can produce a microscopic colitis pattern of injury, mostly lymphocytic colitis and very rarely, collagenous colitis. Grade 1: AST or ALT 1–2.5×upper limit of normal (ULN) and/or T-BIL1–1.5×ULN. Grade 2: AST or ALT 2.5–5×ULN and/or T-BIL 1.5–3×ULN. Grade 3: AST or ALT>5×ULN and/or T-BIL >3×ULN. Grade 4: AST or ALT>8×ULN. Most of the reported cases of ipilimumab-induced liver injury show active panlobular hepatitis with a mixed inflammatory infiltrate consisting predominantly of lymphocytes along with numerous lobular macrophages in aggregates (figures 5 and 6). The macrophages often show a prominent sinusoidal distribution and frequently form loose ‘microgranulomas’ within the hepatic lobules. Scattered eosinophils and neutrophils are present in most cases. The number of plasma cells is variable, with the majority of the cases showing rare or few plasma cells. Foci of confluent necrosis, multifocal hepatocyte apoptosis and ballooning degeneration are also seen. Central vein endothelialitis with variable foci of perivenular inflammatory infiltrate and collapse has also been reported in many cases.14 Hepatocytes show varying degrees of regenerative changes, including binucleation, increased cell size, prominent nucleoli and mitotic figures. The above histological findings of CPI-induced hepatic injury are not specific and require clinicopathological correlation, including a temporal relationship with the drug use for a definitive diagnosis. The histological differential diagnosis includes autoimmune hepatitis (AIH), acute viral hepatitis and drug-induced liver injury (DILI) secondary to other drugs, and acute alcoholic liver disease. 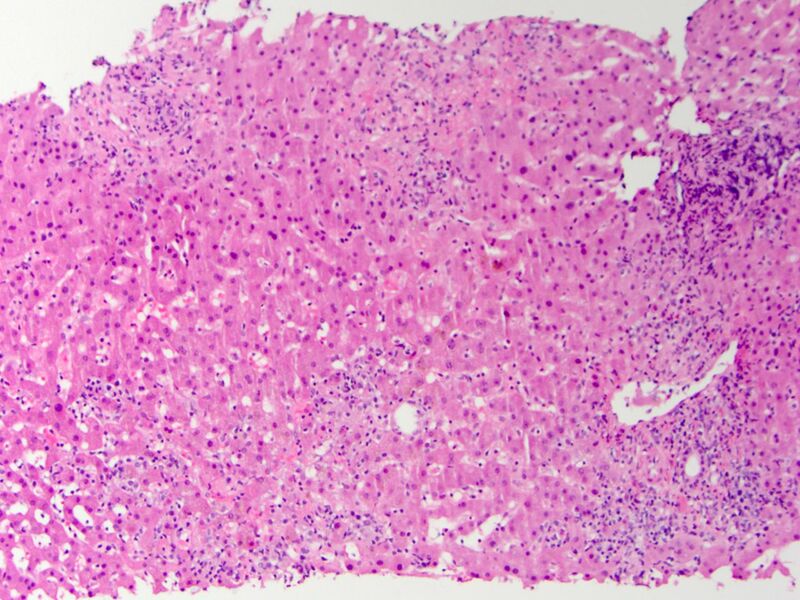 AIH can show almost similar histological picture as CPI therapy-induced hepatitis given the panlobular hepatitis or zone 3 hepatitis patterns of injury and confluent necrosis. Although clinical history including history of CPI therapy and serological studies such as IgG levels and autoantibodies (like antinuclear antibody, antismooth muscle antibody) are required to distinguish primary AIH from ipilimumab-associated hepatitis, there are some histopathological features that may suggest a diagnosis of ipilimumab-associated injury. In contrast to primary AIH, the plasma cell infiltrate is usually not prominent in CPI therapy-induced hepatitis, and in anti-CTLA-4 (ipilimumab)-induced hepatic injury there is prominent histiocytic inflammatory infiltrate, typically showing a sinusoidal distribution and frequently forming aggregates or ‘microgranulomas’ within lobules. These findings are unusual in primary AIH and may suggest a diagnosis of CPI therapy-induced hepatitis in the correct clinical setting. The diagnosis of acute viral hepatitis is based on clinical history/presentation and viral serologies. DILI from other hepatotoxic drugs can show a varied range of histological findings and requires clinical history for a definitive diagnosis. Although immune CPIs have improved survival significantly in patients with advanced-stage cancers, these drugs have the potential to cause irAEs, which in the GI tract/liver may manifest as diarrhoea, colitis or hepatitis. The histopathological features of CTLA-4 inhibitors-induced colitis include autoimmune-like enterocolopathy, and anti-PD-1-induced colitis consists of an active colitis with increased apoptosis and crypt atrophy/dropout and a less reported pattern of lymphocytic colitis. Features of chronicity may be seen in recurrent cases. The histopathological features of CTLA-4 inhibitors-induced hepatic injury consist mostly of active panlobular hepatitis with numerous lobular macrophages in aggregates or centrilobular hepatitis. 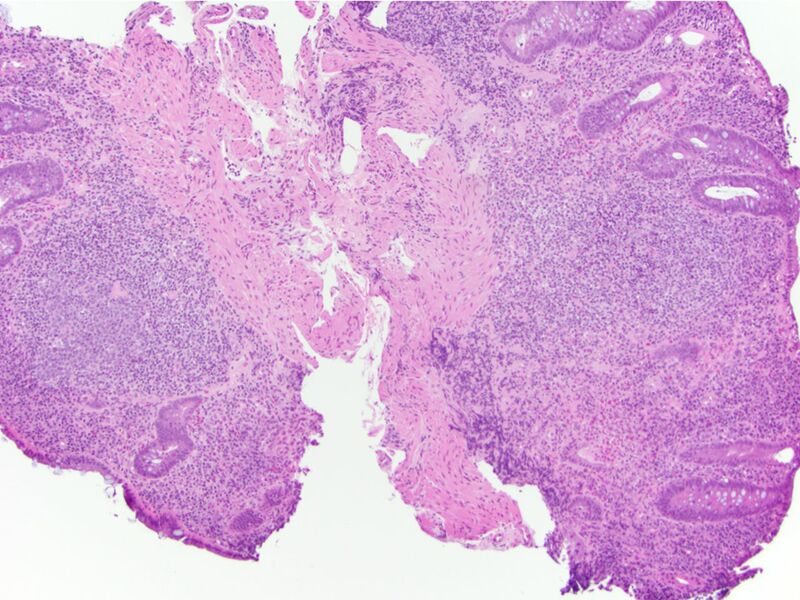 The anti-PD-1-induced hepatic injury exhibits predominantly lobular hepatitis, although confluent necrosis and histiocytic aggregates are less common in the latter. These histopathological features are not entirely specific, and hence correlation with clinical history (particularly drug history), knowledge of the above varied CPI therapy-induced histological patterns and clear communication with the clinical team are crucial for pathologists to differentiate CPI therapy-induced injury from its histopathological mimics in the GI tract (such as infections, acute GVHD, other drug-induced colitis, lymphocytic colitis) and liver (such as AIH, acute viral hepatitis and DILI). Early detection and treatment of these adverse events is important to avoid significant morbidity and mortality. Most irAEs are reversible and respond well to steroid treatment. Checkpoint inhibitor (CPI) therapy has the potential to cause immune related adverse events such as diarrhoea, colitis or hepatitis. 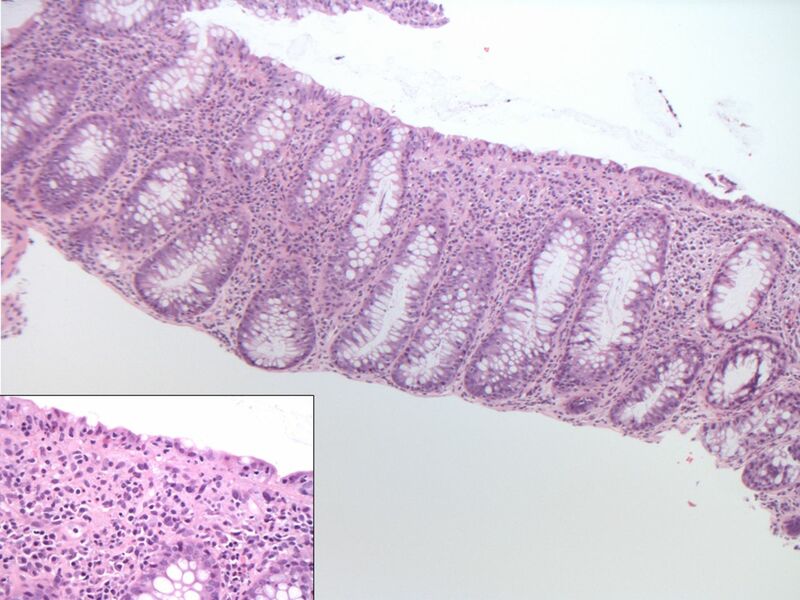 Histologic features of CPI induced colitis usually manifest as active colitis with increased apoptosis and a less reported pattern of lymphocytic colitis. 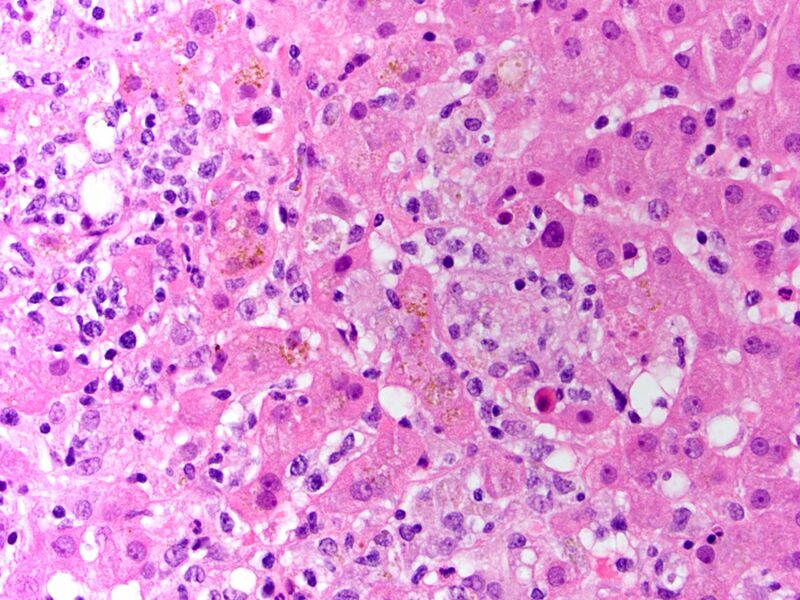 The most common histologic feature of CPI induced hepatic injury is that of an acute hepatitis(autoimmune hepatitis-like)pattern of injury. Correlation with clinical history, high index of clinical suspicion, and knowledge of varied histologic features is essential for a definite diagnosis of CPI induced injury. The authors would like to thank Amitabh Srivastava, MD (Department of Pathology, Brigham and Women’s Hospital) for providing us with figures 5 and 6 in this manuscript. Handling editor Cheok Soon Lee. Contributors Both the authors (DMK, RC) participated actively in this manuscript and can take public responsibility for the content of this paper. All authors critically revised the paper for intellectual content and have approved the final version of the manuscript.